Our new alcohol-free Premium Archivist Formula or our Super Cleaner Formula paired with our award-winning Enzymatic Formula gives you a one-two punch against contaminants on your records. The Premium Archivist Formula is safe for use on all records, including shellacs. 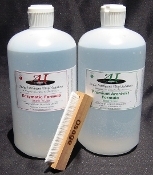 The Super Cleaner Formula is specified for vinyl records. This kit is offered in a cost-saving 32 ounce size. Listener Select record cleaning brushes are sold separately.